What do today’s shoppers need? The mindset of today’s retail shopper has changed. It used to be, people defined themselves by the things they acquired-the best, the most expensive and the latest greatest trends. Today, we are what we experience, not just what we own. We spend much of our time searching for social media content instead of purchasing. How good will this look on my Instagram feed? It seems we are only as good as the sum of our Instagram pictures and online persona. While a picture is worth a thousand words, there needs to be more motivation to drive shoppers to enjoy the in-store experience. For today’s shopper, the emotional sale is an important element in the retail experience. Shoppers are more inclined to buy from people they like and trust, not from bored, disinterested sales people. Now that so many things can be purchased online, an emotional buy-in has become far more important to the in-store experience. Shoppers crave the social interaction that an in-store experience provides. They want to feel a connection, a sense of community that can’t be offered online. 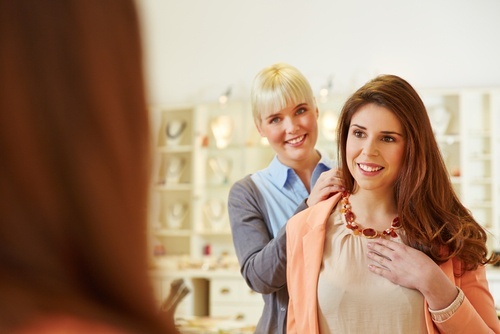 As a retailer, this means taking great care in hiring and training, engaged, interested, Sales Associates who are able to authentically create and maintain this type of bond with customers. Is pricing important? Sure, but what’s more important is effectively selling customers on the most important features of products they desire. This goes back to having knowledgeable Sales Associates who are able to ask the right questions and offer the correct products. The bottom line is, a customer who feels like a valued member of a community will be a loyal customer and continue to shop in your store.